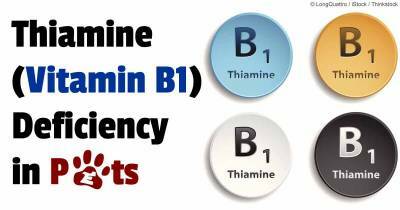 What Causes Thiamine Deficiency (Vitamin B1)? Eating raw fish – raw fish contains enzymes that impede the absorption of and destroy thiamine into the body. Dogs that commonly eat raw fish are susceptible to this enzyme. Dogs with high amounts of sulfides in their diets – sulfides can impede thiamine absorption. Paralysis of the muscles that surround the eye – this can result in limited eye movement. Thiamine injections that can last from three days to three weeks – the length of this therapy is going to depend on the severity of the deficiency. Changes in Diet – Avoid feeding the dog with raw fish and raw meat. Checking the type of dog food that a dog is getting is important too. Choosing brands that do not use chemical preservatives is ideal. Adding Brewer’s Yeast to Meals – Sprinkling a tablespoon of brewer’s yeast, once a day to the dog food can help stimulate the immune system. Thiamine Supplementation – Liquid or tablet supplement given once a day can keep deficiency from happening. Thiamine deficiency in dogs can cause several problems with your pet's vessels as well as nerve damage. It can also cause your dog to become stressed in situations that otherwise would not bother them. Thiamine is considered an anti-stress vitamin because it helps to strengthen your dog's immune system and improves their ability to handle stressful situations. If a deficiency of this vitamin becomes severe, it will lead to a loss of nerve controls, a loss of reflexes, and eventually cause the death of your dog. Thiamine, Vitamin B1, is a member of the B class of water soluble vitamins and your dog's body does not store this vitamin, and as a result, your pet will need to get an adequate intake in their diet or by some type of a supplement. Because it is a water soluble vitamin it is virtually impossible to be toxic to your dog, even in very large doses. Excess of any of the water soluble vitamins is excreted in their urine. Thiamine deficiency in your dog is most commonly caused by eating too much raw fish or raw meats in the diet. Raw fish is extremely dangerous, especially Herring, Smelt, or Catfish. Fish contains an ingredient known as thiaminase which is an enzyme that destroys thiamine. Originally thought to be just a concern for cats, feeding your dog raw fish is as much, if not a bigger concern in dogs, simply because they eat more than cats. Raw meats are also dangerous to your dog. Not only is in deficient in thiamine, it is also very low in calcium. Raw meat also carries the treat of bacteria and parasites, especially those that can easily cause Salmonella poisoning in your dog. Thiamine deficiency can also be caused by feeding your dog an unbalanced diet, or food that has been over processed. However, perhaps the largest single cause of this deficiency in your dog is by Sulfite's. Sulfite's are naturally occurring compounds that are helpful in preventing microbial growths and are used extensively on fruits to preserve their original color. However, they are also used as preservatives in several commercial dog foods and they interfere with the absorption of thiamine in your dog's body. If you use commercial dog food, it is extremely important to look for brands that do not use this chemical as a preservative. to lower and rest near the middle of their body instead of squared off. Your dog will also start to walk with their weight placed on their back legs and they will quickly develop a gait. As the deficiency increases, their back legs will almost look like they are constantly in a crouched position with a much wider stance, and their back legs will also become very stiff. The next symptom that you can watch for is Ataxia, which is a medical term that means without order. This is a very serious situation for your dog as they will start to show several different disturbances in their ability to control their body. They will start to walk in a very wobbly manner because they are losing their motor coordination. However, it can get much more serious. Ataxia can also affect the nerves in the face and effect their eye movements. If you notice any type of abnormal eye movements, it is time to get them to your veterinarian as soon as possible. If severe enough, this condition can also affect your dog's brain. If this is starting to happen you will see even more strange developments with your dog's eyes. The muscles surrounding their eyes will become paralyzed and as a result they will have very limited eye movement and the pupils will become fixed as well as dilated. At this stage, thiamine deficiency is now threatening the life of your dog. There are also additional symptoms that can affect your dog with a deficiency of this vitamin and they may be as severe in some cases. Although Beriberi is thought to be solely a deficiency in humans, several of the same symptoms can affect your dog. This deficiency affects your dog's nervous system, and as a result it can cause tingling in their limbs the same as Beriberi affects humans. If you notice your dog starting to lick all of their feet almost in a chronic manner, it may be because they are having burning or tingling sensations; but unlike humans, they have no way of communicating it other than to licking them. If your dog has developed a serious Thiamine deficiency, your veterinarian will immediately begin Thiamine injections for several days to several weeks, depending on the severity. If you do feed your dog raw fish or raw meat on any type of a regular basis, you will need to immediately stop. You will also need to check very closely the type of food you are buying if you use commercial food and make sure that there are no Sulfite's used as preservatives. However, the best form of treatment for Thiamine deficiency in dogs is to make sure that they are not developing a deficiency to start with. A multi liquid vitamin or a liquid tablet daily can very easily supply your dog with an adequate amount of Thiamine. To help stimulate your dogs immune system and to make it even stronger, you can also sprinkle in a tablespoon of brewers yeast into your dogs food once a day. One tablespoon contains 1.25 mg of B1, Thiamine, and it can be bought at any pet store or health food store, and it is a very inexpensive way to completely eliminate your dog ever getting this deficiency.